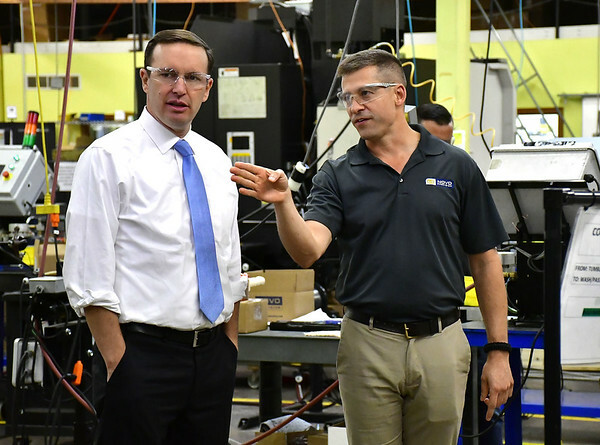 According to Murphy’s announcement, Novo Precision recently launched a project in the heating, ventilation and air conditioning industry with the potential of adding 10 to 15 jobs in the next six months. Also this year, Novo Precision plans on developing the Novo Research and Development Center to enable the company to develop new products and capabilities to include in their equipment line. Novo Precision is located at 150 Dolphin Road, and last year, Bill Hazard, the president of the company, purchased the building at 175 Dolphin Road. In October, Murphy toured both facilities and held a town hall meeting with the company’s employees. Novo Precision focuses on manufacturing precision machine components, cut to length wire products and medical staples and clips. Some of the equipment at Novo Precision includes spring feeding devices and detanglers, rotary wire strengtheners and rotary tub strengtheners. The company sells machines to companies including UTC, Snap-On, and Abbot Medical. Novo works with medical companies such as Medtronic, Boston Scientific and ConMed. The company is active in the Bristol community as well, as it partners with Bristol Technical School and the Connecticut State Apprenticeship Program. When Hazard took over Novo Precision in 2014, the company had 20 employees. The company now serves as an employer to 41 people in its various areas of operation. To learn more about Novo Precision, please call 860-583-0517 or visit the company’s website at www.novoprecision.com . Posted in New Britain Herald, Business, General News, on Monday, 14 January 2019 20:15. Updated: Monday, 14 January 2019 20:17.